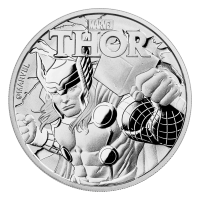 Order your 10 oz 2019 Australian Kookaburra silver coin from our store online to enjoy the web’s lowest rate! The coin’s reverse features an all new kookaburra design; a magnificently detailed kookaburra surveys his native wilderness, perched on a drift log, overlooking a lakeside landscape of native Australian flora. Also on the reverse, the Australian Kookaburra title, along with year of issue, metal weight, content and purity. The obverse feature is Ian Rank-Broadley’s striking render of Elizabeth II in profile, seen wearing her luxurious State Diadem. Also on the obverse, Elizabeth II’s name, as well as the country of origin and the coin’s unique denominational value. Australia is known for its wealth of unique and beautiful indigenous fauna and flora; the Australian laughing kookaburra, featured here, is the largest bird in the kingfisher family. Celebrate the richness of the Australian wilderness, fortify your holdings with a 10 oz 2019 Australian Kookaburra silver coin now! Vorderseite Das neuste Abbild von Königin Elisabeth II. nach Jody Clark, die Worte "Elizabeth II Australia 2019 10 Dollars" und die Initialen des Künstlers. Rückseite Ein Kookaburra ruht sich auf einem Stück Holz, das aus dem Wasser hervorsteht, aus. Umrahmt von dem Münztitel, Jahr, Gewicht und Reinheitsgrad. Das neuste Abbild von Königin Elisabeth II. nach Jody Clark, die Worte "Elizabeth II Australia 2019 10 Dollars" und die Initialen des Künstlers. Ein Kookaburra ruht sich auf einem Stück Holz, das aus dem Wasser hervorsteht, aus. Umrahmt von dem Münztitel, Jahr, Gewicht und Reinheitsgrad. 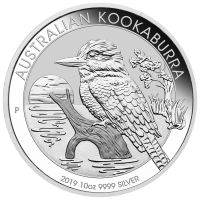 10 oz Silbermünze - australischer Kookaburra - 2019 Order your 10 oz 2019 Australian Kookaburra silver coin from our store online to enjoy the web’s lowest rate! 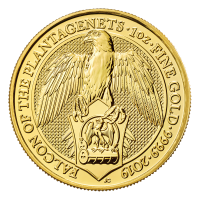 The coin’s reverse features an all new kookaburra design; a magnificently detailed kookaburra surveys his native wilderness, perched on a drift log, overlooking a lakeside landscape of native Australian flora. Also on the reverse, the Australian Kookaburra title, along with year of issue, metal weight, content and purity. The obverse feature is Ian Rank-Broadley’s striking render of Elizabeth II in profile, seen wearing her luxurious State Diadem. 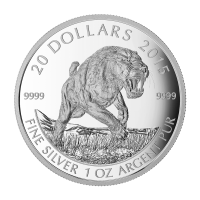 Also on the obverse, Elizabeth II’s name, as well as the country of origin and the coin’s unique denominational value. Australia is known for its wealth of unique and beautiful indigenous fauna and flora; the Australian laughing kookaburra, featured here, is the largest bird in the kingfisher family. Celebrate the richness of the Australian wilderness, fortify your holdings with a 10 oz 2019 Australian Kookaburra silver coin now!